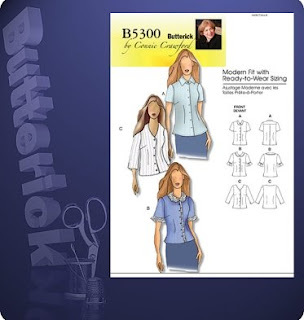 My next project is going to be Butterick 5300 which is one of Connie Crawford's patterns. This pattern is special in that it has the FBA already built in. The pattern comes sized for the ABC cup and the D-DD cup. I've met Connie Crawford in person. She is very talented and has done so much to fit the plus sized woman. She hasn't always hit the mark, but at least she is trying to make patterns for this much neglected market. When I say she hasn't always hit the mark, what I mean is that she tends to rotate out some of the dart to an under bust dart and then leave it unsewn. This leaves fabric hanging from the bust like maternity wear. Granted, if your belly is bigger than your bust, like pregnant bellies are, than this would work perfectly fine for you. It doesn't work on me, however. Debbie Cook just made this top using View B with the peter pan collar and it fit her quite nicely. With her recommendation, I decided to give it a try. I first bought the smaller set of sizes because that's what I do, then alter up so the shoulders would fit, but Debbie said that the shoulders were small in the larger sizes so I went out and bought it again in the larger sizes. I decided that I would make View A, with the pointed collar and collar band with short sleeves. After studying the size chart and Debbie's review, I decided to go with a straight 1x. I cut out the pattern and then compared it to my block I made using Kenneth King's Moulage. The comparison was amazing. This pattern looks like it was drafted just for me. Even the shoulder slope and shoulder width is exactly the same. Well maybe a little smaller since my block only has 1/2" seam allowances. The only change I see that I'll need to make is to move the underbust dart up and possibly shorten the top half of it or else the waist shaping will be in the wrong place. It needs to be moved up about 1-3/4 inches which is a lot, but since I'm quite short waisted, that makes sense. The extra length above the back shoulder has me worried, but we'll see after the muslin. I'm very tempted to just omit the muslin altogether, but I won't. How cool would it be if I could sew this pattern just as is right from the envelope? If I can, then I'm also going to go buy me a fist full of lotto tickets, because it'll be my lucky day. When I sew the final up I'm going to change out the front facing for a button band and I've shortened the sleeves by 2". Again, this was Debbie Cook's recommendation and I have to agree with her that the longer sleeves tend to look frumpy. I'm off to sew up the muslin. I'll let you know how it works. Keep your fingers crossed for me. You're FUNNY, Sherril!! Goooo, Girl!! Looking forward to seeing your results!! 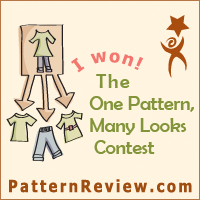 Wow, the similarities between your block and the pattern are amazing! Can't wait to see how this turns out. I might be adding yet another pattern to my list. Awesome that the pattern almost totally matches your moulage - even to the darts! Very exciting! The match is amazing! Are these sized for petites? I've nominated you for the sisterhood award. Love following your adventures!